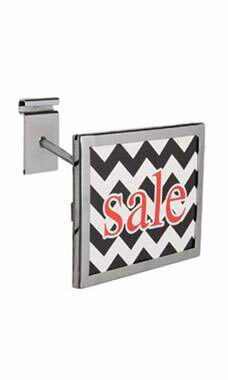 Draw attention to your items with this rectangle face out sign holder. This face out comes with a stylish chrome finish, the perfect addition to any grid wall panels. Simply place this sign holder onto any grid wall panel and highlight your merchandise. Any 7”W X 5.5” H signs fit perfectly into this holder. Perfect for any retailer, the face out will be sure to attract attention.